With just hours to go before the host city of the 2020 Olympic and Paralympic Games is chosen, I’m delighted to share my latest Art of Running project, completed late this afternoon. 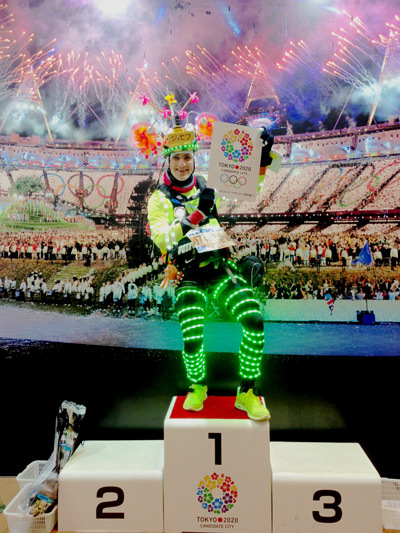 I ran this in support of the Tokyo 2020 campaign: having seen the positive impact that the London games had on my home country last year, I would love for the Games to come to Japan. 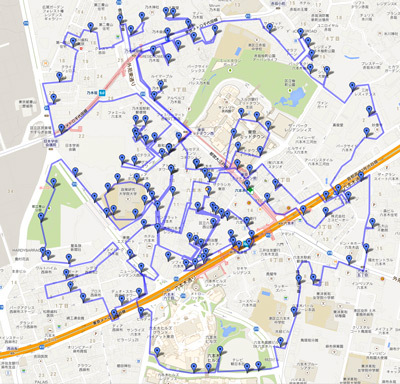 This was by far the most ambitious piece I’ve done to date, and saw me run 385km of Tokyo streets. The design, that of the emblem of the Tokyo 2020 Olympic campaign, features 83 petals, the outlines of which are between 2km and 8km each. I chose to place the design in the heart of the city, with the Imperial Palace as the centrepiece around which the flowers bloom. This project was unlike any other I’ve attempted. For a start, the detail and scale of the picture meant that my usual method of ‘painting’ the picture wouldn’t work – there were too many uncrossable rivers, roads and other obstacles in the way. So, I experimented, and came up with a new method, similar to join-the-dots. This brought with it the necessity to use two GPS trackers (an iPhone and a Galaxy S4 running Runkeeper) …and to run a lot further than I usually would, what with all the running around obstacles. It was also unlike any other I’ve attempted in that the course was incredibly diverse. In addition to the well-known shopping / entertainment districts, there were many quiet residential areas hidden away in places you’d never expect. Little lanes without lighting, tiny shrines tucked behind skyscrapers, incredibly steep hills that really should be serviced by ropeways, parks that have been left to grow wild with an abundance of meadow flowers. My route took me into hospitals and hotels, across university campuses, through tunnels, and across countless bridges. Three petals required me to run around Tsukiji fish market, another two saw me running around the Russian Embassy no less than 8 times (leaving some bemused policemen). During another run I was stopped twice by police, the second time, a couple of hours after the first, was for encouragement by a policeman who’d heard what I was doing over the police radio. I was shouted at by a baseball team manger and laughed at by the players for running across a baseball pitch during a game at Meiji Jingu (!). I was cheered on my way several times by people who recognised me from my other projects and asked what I was drawing. In fact, wherever I went, the people I met were welcoming; smiling, laughing, asking questions, encouraging – regardless of their age or occupation. Through this project I feel I’ve come to know Tokyo a lot better, and I’ve also come to feel a lot more at home here. It’s a very special city, with incredible diversity, and great warmth too. It’s my hope that Tokyo is chosen as the host city for the 2020 Olympics – it would be a huge boost for the city and country – and I have no doubt it would also result in a very memorable games for people coming from across the globe. If you’d like to check out the route in more detail, download the GPS data here and open all files in Google Earth. 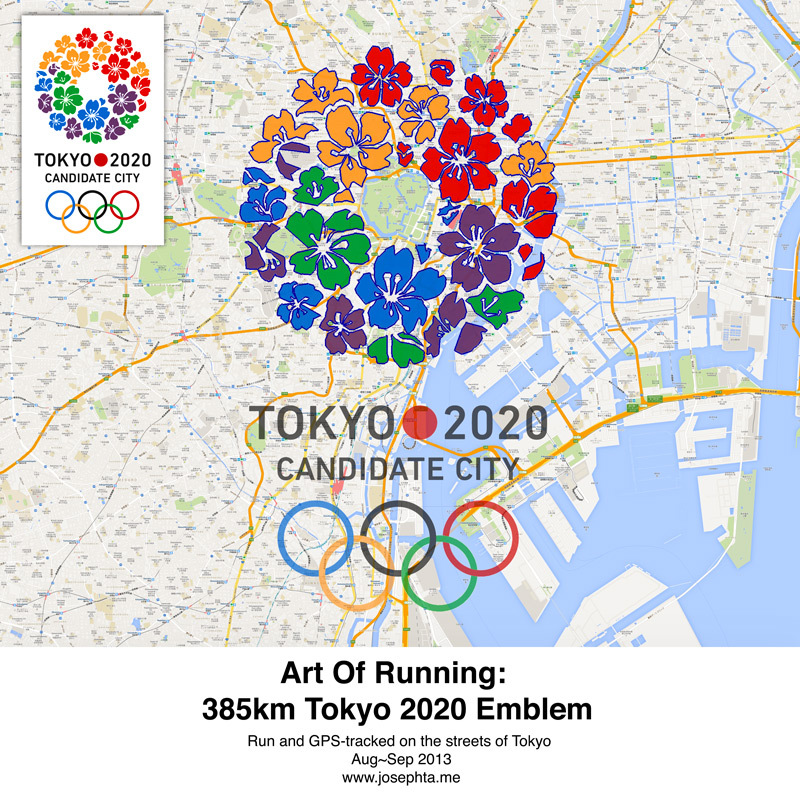 I’m delighted that this project had the desired effect – bringing the Olympics to Tokyo! Tremendously excited already – it’s going to be a great 7 years!